I arrived in South Sudan only a few days ago, eager to get my first few glimpses of Africa’s – and the world’s – newest country. I remember well the day that South Sudan gained its independence. I was in New York at the time, working for a diplomatic advisory group that had been advising the South Sudanese leadership through the country’s succession and process of gaining membership to the United Nations. Diplomats from missions around the globe and South Sudanese representatives alike were visibly excited. Even stone-faced UN Secretary-General Ban Ki Moon cracked a smile. But the celebrations in New York paled in comparison to the outpouring of emotion that took place back in South Sudan. In Juba, the capital of the new country, people poured into the streets at midnight, waiving flags, singing and dancing with sheer joy. (Anecdotally, as I learned this week, there were those in the South who cried at the breakup of their country). It had been a long, hard struggle for the South Sudanese to gain independence and their day had finally come. Their fight for rights and control from Sudan pre-dated Sudan’s independence from Britain itself. The southern movement for independence led to a rebellion in the 60s and again in the 80s. The response from the central government was brutal to say the least, resulting in extreme displacement, deaths and suffering. It wasn’t until the US focused its foreign policy on Sudan in 2005 that progress was finally made (before you ask, yes, Sudan has oil). The US’s efforts culminated in the signing of a Comprehensive Peace Agreement between the two sides, which set the stage for southerners to vote for or against independence in a referendum. 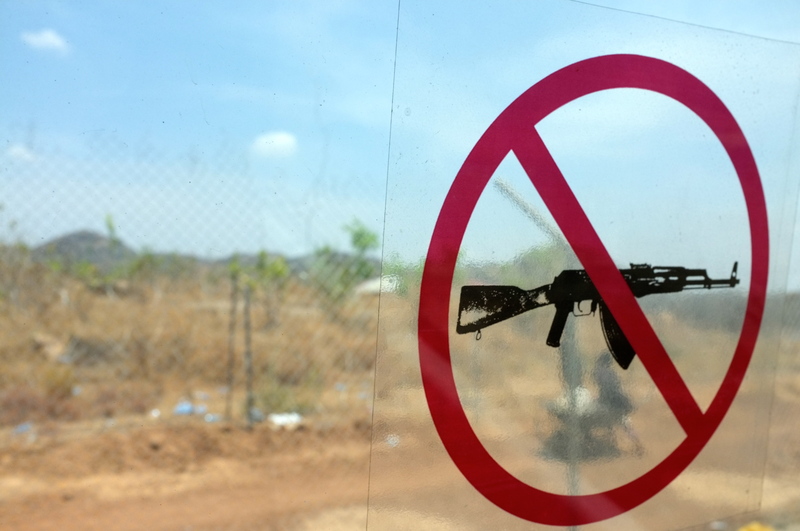 (The US’s influence on the creation of South Sudan is still evident today. 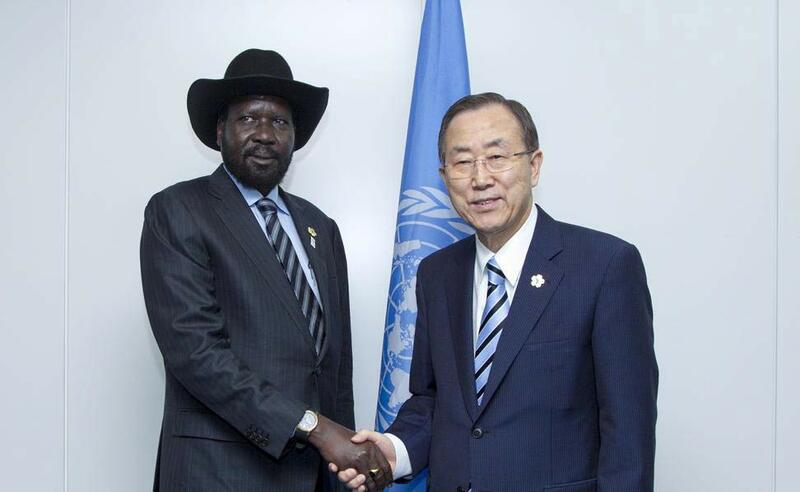 Just take one look at its President, Salva Kiir, who is rarely seen without his signature Texas-style cowboy hat, a gift from the former US President). Hopes were extraordinarily high for South Sudan. Compared to its neighbour to the north, which is still run by a President indicted by the International Criminal Court, South Sudan was seen to hold great promise. It made sense to the international community that it should be independent. Whereas the Sudanese population is primarily Muslim and Arab-dominated, the South is mostly animist and Christian. The countries were completely distinct religiously and even geographically, with Sudan consisting mostly of desert and South Sudan being much more lush by comparison – you can even see the line marking the transition from brown to green from satellite images. Generally speaking, it is extremely difficult for any population or territory achieve succession. The international system is designed to preserve the integrity of states. However, what made South Sudan unique was that it had a history of being treated as a separate and distinct region from the north by the British when effectively under colonial rule, which helped to set a precedent. The international community was completely invested in South Sudan… and perhaps we were all a bit naïve about the immense challenges that the country would face. But no one expected the level of violence and chaos that has taken hold here over the past few months, just 2 ½ years after independence. Now that I’ve introduced you to a bit of the history of the country, let’s cover some basic facts before delving into the current situation. South Sudan is one of the poorest countries on earth. While it has experienced a certain influx of investment following independence, its GDP remains one of the lowest and it has only a 27% literacy rate. As I have discovered first-hand running around Juba’s streets, there are only 35 miles of paved road in the entire country. South Sudan’s economy was once based on subsistence agriculture, but it is now highly oil-dependent. One of the main sources of tension with Sudan centres around the sharing of oil revenues. Although the majority of oil reserves in the former Sudan are located in now-South Sudan, the refineries and the pipelines are all in the north (in Sudan proper), which has created a highly volatile situation. Oil production is reportedly down 30% since the violence broke out. On 15 December 2013, seemingly out of the blue (but in hindsight perhaps not), violence broke out in the headquarters of the Sudan People’s Liberation Army (SPLA – South Sudan’s army), the details of which are still unclear. This single event triggered ethnic tensions and fighting between the Dinkas, the ethnic group of the current President, and the Nuers, the ethnic group of the former Vice-President, Riek Machar. President Kiir had dismissed Machar as his vice president earlier in the year and fired his entire cabinet, which should have been forewarning to all of growing tensions. Within a matter of days, tens of thousands of individuals became displaced by the conflict and turned to the UN mission – UNMISS – for protection. In an unprecedented move, the UN opened up its bases to the internally displaced persons (IDPs), where thousands are still camped out today. There are new arrivals in some areas still on a daily or weekly basis, depending on the shifting patterns of fighting. Machar has become the de facto leader of the rebels fighting against the government forces and the situation is extremely fluid. Some towns have changed hands four or five times, which has really impacted who needs assistance and protection at what time – and from whom. From what I’ve learned so far on the ground, the intense hatred that has emerged between ethnic groups runs deeply… and the fact that one’s ethnicity is hard (if not impossible) to hide creates much fear amongst the displaced populations. Not only to the Nuer and Dinka speak different languages, but they are often visibly distinct, with the Nuer having horizontal tribal markings on their forehead and the Dinka having “v-shaped” markings. The area where I will be based from Wednesday onwards is called Awerial in Lakes State, in a town called Minkammen. 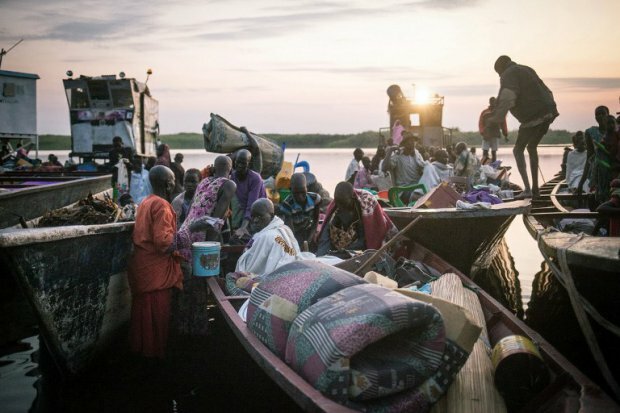 While it is difficult to estimate numbers at this point due to IDP flows, there were at one time 75000 IDPs in the area who had arrived by boat. 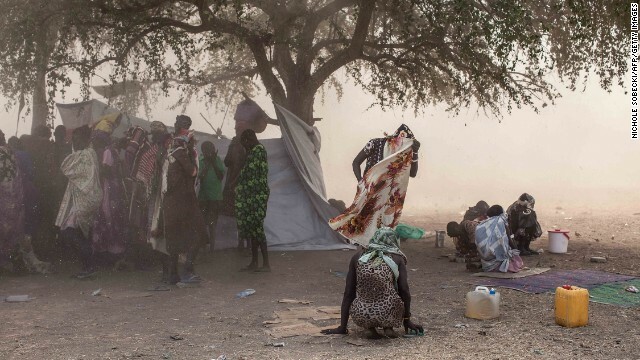 Most are coming from Bor, where there has – and continues to be – intense fighting, which is about 20 km up the river. No camp has been established for the IDPs due to the proximity to the conflict, so most people are just living in the open in about a 5 km area, spread out under the few trees available. 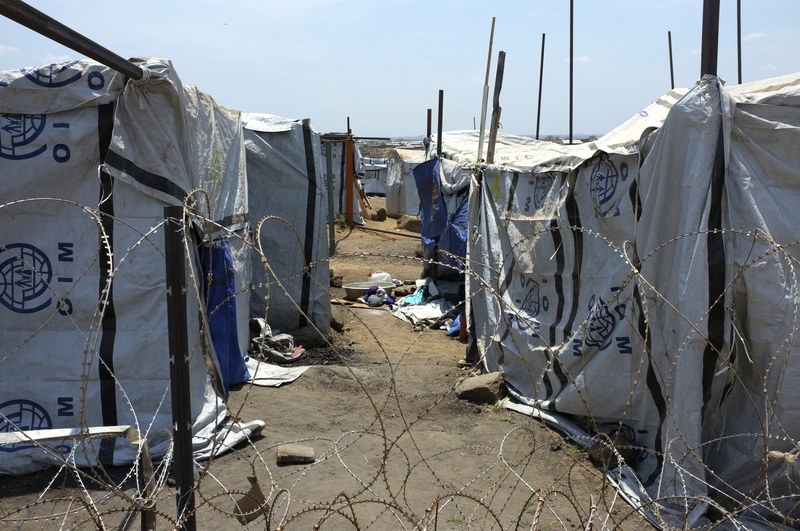 I had the chance this week to visit the IDP camps in Juba (renamed “protection of civilian” sites on account of the fact that they are in the UN bases). I was amazed at the resourcefulness of the camp’s residents – shisha shops, restaurants, and little stores have popped up, run by some of the more ‘wealthy’ IDPs. But as the conflict continues, and as we head into the rainy season in a few weeks, personal resources will dry up and even the ‘wealthy’ IDPs will become more and more reliant on the international community for assistance. Food distribution can be complex – those who are most vulnerable should receive priority, but it is often very difficult to make sure this happens. Medical treatment is basic, but essential in the camps. For some, even heading outside the camps to the government-run hospitals in town presents too much of a risk (and based on recent reports, for good reason). At every stage, the IDP communities themselves should be – and hopefully are – involved in the planning and decision-making process concerning their well-being… but we are still in emergency mode and much of what we as humanitarians end up doing should really be called crisis management. I hope to be able to share with you my thoughts and experiences, to the extent possible (in view of protection and confidentiality concerns), about what is happening on the ground. I feel it is important for those on the outside to be informed about what is happening here. It is true that there are many other conflicts going on in the world right now that may be overshadowing South Sudan in the news, but what little I can put out there, I will. So, how am I going to deal with the emotions, pressure and stress of working in the context of this emergency? The same way I deal with any stress in life: by getting up every day, putting on my running shoes, and moving forward… I have only managed 30 minute runs at this point in the heat, but every bit will help. I fly out to Awerial on Wednesday and hope to scope out the running situation there. If I could do it in Afghanistan, surely I can do it here. Happy trails everyone, and enjoy that next hot shower for me! Stephanie …. Once again you have given us all much pause for thought. Your insightful comments paint a well informed landscape for your readers and I for one am much richer for reading your words (somehow I don’t think I’m unique in that! 😄) you truly are a remarkable traveller and generous to a fault for sharing your experiences with us. The fact that running is at the heart of your message serves to make your tales both precious and relevant at the same time. I’m holding my breath for the next installment! Stay safe, run when you can and keep the posts rolling in! Thank you for writing this! I have a friend who works with the Africa Education and Leadership Initiative and visits South Sudan often. When she is not there she is traveling around the US raising money to fund Africa ELI. I’ve been reading your blog on and off for a while, and you do a great job inspiring me to get my physical self in order and sync it with my psychological self, but I never fully realized what a wonderful human being you are! I admire your energy and your charm – the willingness to set an example *and* to stay as human as possible in the process is really a work of art. Thank you so much for this! Comments like this really help keep me going, especially on days like today… I’ve hit the field and it is full on. Very overwhelming. But I will try to keep running and blogging 🙂 Thanks for following!! What can we say? It’s not the best place to be running so be careful. We wish you all the best.! We hope too this new nation resolves its problems as soon as possible. 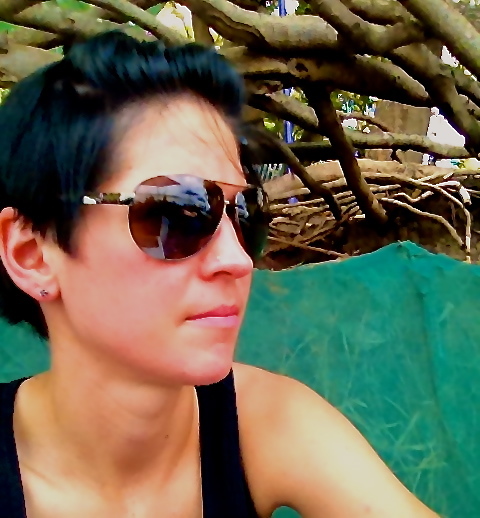 Pingback: An Ultra Race Against Hunger and Violence: Q&A with Ultrarunner Stephanie Case in South Sudan | The Runner's Trip: Run Long, Travel Far, Discover More.